The Most Spectacular Kayak Fishing Destinations in the U.S.
It’s tough to beat the odd sensation of serenity and thrill you experience while kayak fishing. The closeness to the water, the tug of the line and the pride that comes with a great catch is hard to beat. If you’re wondering where to go to take in the sights and the fish, look no further. From Hawaii to Maryland, reel in some impressive fish in these stellar spots. Nicknamed “the Land of the Giants,” kayak fishing on the Kona Coast is an experience like no other. When you’re ready to step up and fish some huge tuna and grey snapper, come prepared, as there are also tiger sharks in the area. For experienced paddlers, though, the Kona Coast offers big rewards and incredible scenery. This serene spot is off limits to motorized boats and perfect for anglers that are just getting started or those looking for a relaxing day out on the water. Teeming with trout, largemouth bass and other species, this clear, calm reservoir makes for a great trip. Photo of Devils River, courtesy of Texas Parks & Wildlife. When it comes to saltwater kayaking fishing, it’s tough to beat the great spots in Florida and the Indian River Lagoon is a prime example. On Florida’s east coast, this national scenic byway offers access to tarpon, speckled trout and, the popular redfish. Lively year-round, there are campsites and attractions all around this awesome spot. Photo of Okmulgee Lake, courtesy of Thomas & Dianne Jones. 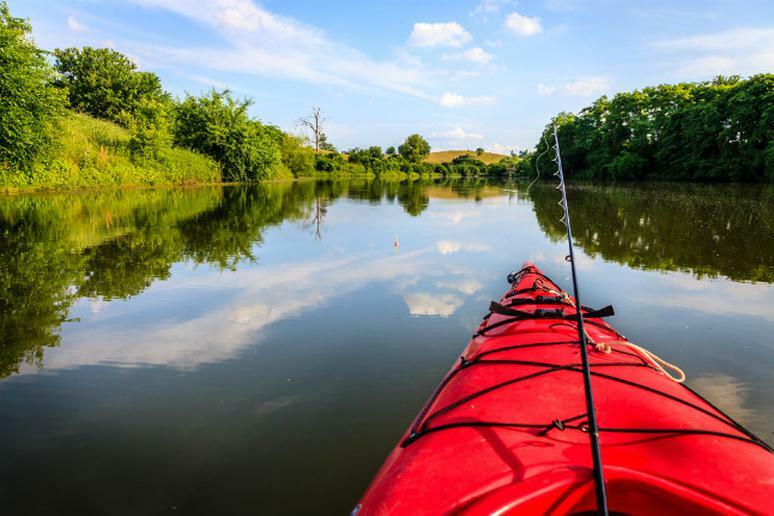 This no frills kayak fishing spot has it all—lots of lake, beautiful scenery and plenty of fish. Reel in catfish, sunfish, spotted bass and largemouth and smallmouth bass, among others. You can easily access the lake from a small dock on the east side of the lake and campsites afford you a multi-day trip.